The woodturning courses at Woody’s Place offer an exciting day of designing and then shaping a woodturning blank into your piece of art on the lathe. Spinning tops, vases, bowls; functional or arty – you get to take your creativity home with you as a one-off memento. If you’re after a multi-day activity, why not try your hand at one of our woodworking classes. You could create a piece of furniture or restore a pre-loved item. 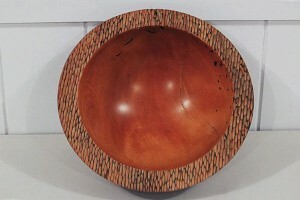 Our Taupo woodturning workshops start at around 8am and last between 6 and 8 hours. Each stage of the woodturning process is demonstrated so you have a concept of the journey you will take. Chisel the blank, sand, oil and wax your piece and maybe add some texturing or embellishments. To finish you can write your name on the bottom of your creation. If you book your woodturning course between November and April (and the weather is fine) we can organise food and wine at sunset on Kinloch Beach. Just contact Chris and Woody’s Place can plan your day. If you’re after a multi-day activity, why not try your hand at one of our woodworking classes. You could create a piece of furniture or restore a pre-loved item.